Yacht chartering is the ideal way to see Maryland’s western and eastern shores. The Chesapeake Bay is the largest estuary in the US, with rivers, wetlands and forest edges forming a gorgeous backdrop for this well-known cruising area. Full of potential and hidden gems, it is the perfect location for sailors of all ages and abilities. When you sail from Annapolis you have many opportunities at your fingertips, from exploring the historic Annapolis Harbor or the City of Baltimore, to quaint fishing villages like St. Michaels, Oxford and Solomons Island, all lined with shops, galleries and local cuisine. Or maybe you just want to get away from it all and sail up one of the many secluded creeks of the Bay for a little serenity. Although boats appear year ‘round on the bay, the most popular time for recreational sailing is between April and November. During the summer month, lush green scenery hangs over the eastern shores, while a light breeze cools off the hot summer sun. Keep your eyes open for osprey nesting on top of the channel markers, crabs swimming around nearby pilings, and blue heron posing on the shoreline as you cruise along to your evening destination. In the fall, you can expect the breeze to pick up a little and the scenery to take on a whole new look of yellow, orange, and red. The water is still warm enough for a swim, and the evenings cool enough for a sweatshirt. There is plenty of sailing to be found on these waters. The Bay stretches approximately 200 miles from the Susquehanna River to the Atlantic Ocean, and spans up to 30 miles at its widest point in the middle. More than 150 rivers flow into the bay, many of which are navigable by boat. A few small islands hug the coast of the Delmarva peninsula, also known as home to the watermen of the eastern shore, and the surrounding area is beautiful and peaceful as you sail point to point. Many of the larger towns have full-service marinas with provisions and sightseeing an easy walk away. A few highlights of the Bay are the U.S. Naval Academy in Annapolis, the Chesapeake Maritime Museum in St. Michaels, Drum Point Lighthouse at the Calvert Marine Museum in Solomons Island, and Fort McHenry and the National Aquarium in Baltimore. 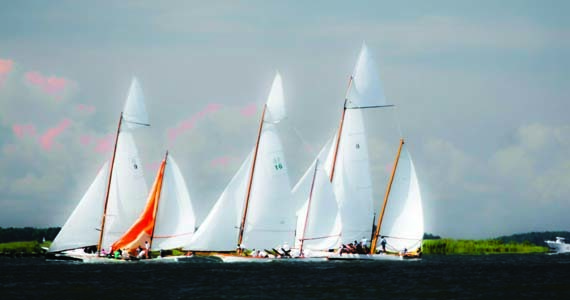 Whether you are a weekend sailor or vacationing family, sailing the Chesapeake has something for everyone to enjoy. Annapolis Bay Charters has been serving their clients on the Chesapeake Bay for over 33 years, and now as part of Dream Yacht Charter they are able to offer sailing vacations at over 33 locations around the world in bareboats, by-the-cabin vacations and luxury crewed yachts. For more information, call 866-469-0912 or 800-991-1776, or visit annapolisbaycharters.net and dreamyachtcharter.com.